CD review: "Live in NYC '97"
This review first appeared in the April 18, 1998 edition of the American Reporter. Good lord, has it really been thirty years since Johnny Winter came storming on the national stage, playing as much electric guitar as anyone ever had, setting the stage for latter visionaries like Stevie Ray Vaughan? Winter was never the experimenter that Jimi Hendrix was, but when it came to straight-up straight-ahead blues guitar Winter could more than hold his own. More importantly, Winter beat his heroin addiction and survived to not only tell about it, but to continue growing as an artist. Not that he's ever strayed far from his blues roots. In fact, once he got out of his original contract with Columbia Records  the one that tried to turn him into a rock 'n' roll star, Winter headed right back to Muddy Waters, with whom he played during the Chicago bluesman's last years. Winter then ended up on the independent Alligator label, where he was able  no, encouraged  to indulge his passion for the blues. He cut three outstanding albums for Alligator in the '80s, then jumped back to major labels as an established blues star no longer expected to cater to rock tastes. 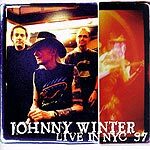 The latest installment in the re-invention of Johnny Winter finds him in front of an appreciative audience running through the blues and even some old hits. Included in the set are covers of blues standards like Muddy's signature tune, "Got My Mojo Working," Freddie King's "Hideaway," Jimmy Reed's "The Sun Is Shining," Elmore James' "The Sky is Crying" and Snooks Eaglin's "Drop the Bomb." But there are also non-blues tunes like a cover of Ray Charles' "Black Jack" and the old Piney Brown boogie-woogie tune, "Just a Little Bit." There's even a relic from Winter's rock days, his cover of Johnny "Guitar" Watson's "Johnny Guitar." Throughout, Winter not only shows he's still  at going on 60 years now  one of the best guitarists on the scene, but that he's not lost his edge. Never a polished vocalist, Winter continues to be an example of passion over artistry when singing. Never mind. Nobody buys a Johnny Winter album confusing him with Sinatra. You buy Winter for guitar, and guitar he delivers.